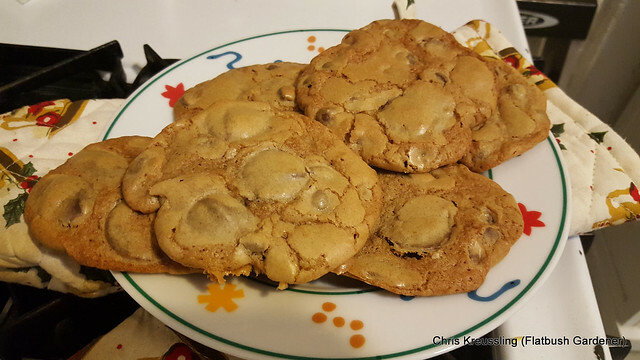 I started with "The Essential Chewy Chocolate Chip Cookie" from the King Arthur Flour Cookie Companion cookbook. I doubled the recipe, and made a few substitutions and additions, noted below. I was getting the taste I wanted, but not the texture: they kept coming out too high and dry. They would rise in the oven, but they wouldn't fall. I finally realized I just needed to reduce the flour called for in the original recipe to balance my other changes. This made them come out perfect, just the way I wanted them: slightly browned and crisp at the edges, soft and chewy in the centers. I also like to amp up the chocolate chips, both by increasing the amount, and using different kinds, mixing milk and semi-sweet chocolates. My favorite are the chocolate drops from NYC's own Lilac Chocolates. They make them in at least three different varieties: milk, dark, and 72% extra-dark. Pre-heat your oven to 375F. You can also line some heavy-duty cookie sheets with parchment paper. Whip up the butter until light and fluffy. Then cream the sugars into them and whip them up even more. The batter should be light brown in color. Beat in the rest of the flavorings. If you're using cider vinegar, it does double duty: first as the chemical reagent for the baking soda, second with the slight cidery taste. At this point I'll do a taste test, before beating in the eggs one at a time. You want to blend the baking soda and powder into the wet batter so they can dissolve, disperse, and begin their chemical reactions to give lift to the dough in the oven. I've made the mistake of sifting them with the flour, treating them as just other "dry" ingredients, and they don't get incorporated as well. Sift and gradually/slowly stir in the flour, until no dry flecks or lumps remain. Again, I've made the mistake of treating the flour like the rest of the batter, trying to beat it in. That makes for tough, not tender, cookies. The dough will be wet. You should be able to scoop some out with a tablespoon, and have it stick to the spoon. If it's too loose, add some more flour to get the texture you want. Finally, stir in, by hand, the chocolate chips and chunks of your choice. Cover the dough tightly, so it doesn't dry out - some plastic food wrap pushed down onto the surface of the dough works well. - and chill in the refrigerator for a few hours, or overnight. You can also start baking immediately. At this point, I'll bake at least one sheet of cookies, both to test the dough, and for (nearly) instant gratification. Cover a heavy-duty cookie sheet with parchment paper. Scoop out heaping tablespoons of dough onto the paper. Stagger them so they have room to spread without touching. On a standard-"half-sheet", I can get 5 rows from one end to the other with 3 heaps at each end and the center, and 2 heaps in between those rows. 3, 2, 3, 2, and 3: a baker's dozen! In the first few minutes after putting the tray in the oven, the dough should spread with the heat, and rise with the leaveners. Bake for 10-12 minutes. Your eyes and nose are the best judge of "done" here. Sniff for the slight smell of burnt sugar, and look for the edges to be set and just starting to darken. The centers should still look wet. Ideally, they will have started to collapse, but don't wait for that - you don't want them to set while risen. Remove the sheet and set aside. Let the cookies cool on the sheet until they slide easily without squishing, bending, or breaking up. Remove the individual cookies to a rack to cool completely. (Or eat while still warm and gooey).